Boudin, smoked rabbit sausage, green beans with tasso ham and potatoes, and etouffée are among the legendary dishes at Bellue's Fine Cajun Cuisine. 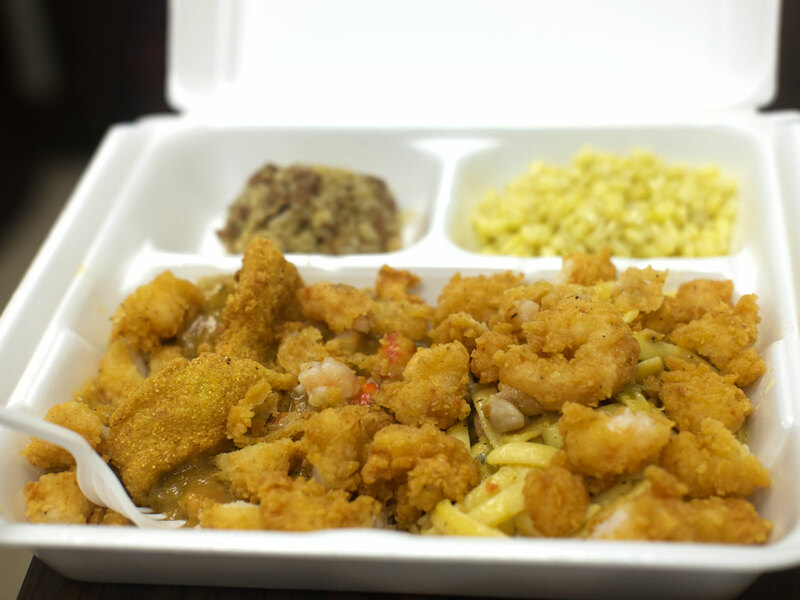 As you drive along Interstate 110 from Baton Rouge Airport into town, you'll pass a sign sticking up from below for Bellue's Fine Cajun Cuisine. What you can't see as you drive by is the deafening antique steam engine whistle Wirt Bellue has welded onto it—for no reason other than the fun of it (and making anyone in earshot jump a mile when he pulls the cord on it). Inside, the Louisiana accents are thick, and the roux is even thicker. Bellue is an ex-cop, a welder, and a restaurant owner. But mostly Bellue combines the latter two, using his welding skills to serve better food at his tiny restaurant/deli/butcher shop: he’s made a giant skillet that rocks back and forth to let him cook 1000 pounds of crawfish étouffée at once, a rotating flat-top that can perfectly evenly toast 40 po’boy buns at once, and a gumbo pot that he starts with 100 pounds of tasso ham he smokes out back over local pecan wood. The restaurant has been around for more than 50 years now, and Bellue is old enough that he can get away with not having an email address or owning a cell phone. But in 1966 he was a fresh-faced 21-year-old who had just joined the police force and lived on Church’s Chicken and free doughnuts through overnight shifts. During the day he played around with welding, opening up his metalwork shop in 1968. Shortly after that, a motorcycle injury followed by an incident during a robbery left him unable to work, so he rigged up one of the smokers he’d made in his shop and started making boudin—Cajun rice and meat sausages. “A guy came in and bought some to sell at his store—30 pounds in white trash bags,” Bellue recalls of his early sales. “Then he needed more the next day.” Word spread quickly, and soon people from the nearby Exxon refinery heard about it and stopped by. So he drew up some plans to convert the shop from welding to cooking. Today, the wood-walled shop gives off a bit of a cabin vibe, with fewer than a dozen tables between two rooms, all unadorned save for a few condiments and a napkin dispenser. A freezer in the main room holds smoked rabbit sausage, rice dressing, and frozen shrimp fettuccine, while a glass case holds an array of sodas and more small-animal-stuffed sausages. WordArt-style signs remind customers about deer chili, pralines, and a tur-duc-ken po’ boy. In the back room—the open door labeled: “Employees only”—a former employee has brought a friend from out of town, and as they dig into fried boudin sausage links and buttery lemon cake, they put together an order for a box of food to ship to a third friend. In front, a woman talks up how good the Cajun food is here, brandishing that her grandmother’s first language was French as her credentials. But what’s surprising about the food at Bellue's is that while everything is cooked from scratch—you won't find any cans, says Bellue—it’s all frozen before it hits the table. He uses the same kind of commitment to care and consistency you might imagine is necessary for welding—deconstructing the process behind each dish, then designing his own custom kitchen appliances and vessels to recreate it: the peppery lima beans that melt like M&M’s in your mouth and flavorful green beans with tasso and potatoes come out of a pressure cooker that makes 800 to 1000 pounds of them at a time. Everything is cooked in these enormous batches based on precise recipes written in his notebook. Each ingredient is measured out in grams—using, the ex-cop points out, “the same scale as the kids use on the corner selling cocaine.” The biggest variable he has is that the McCormick pepper they use fluctuates in piquancy. The custom-made 24-inch diameter, rocket-ship-shaped cooker rocks back and forth, eliminating the need to stir. “Can’t take that chance,” says Bellue. His methods remove the chance of human error—or just inconsistency—changing his dishes. “Nobody’s going to care like I do,” he says of his employees. But with his system, “Whether they care or not, it’s gonna happen.” The dishes will be made, and they will turn out exactly as they should be, exactly the same in 1968 as 1998 as 2018. 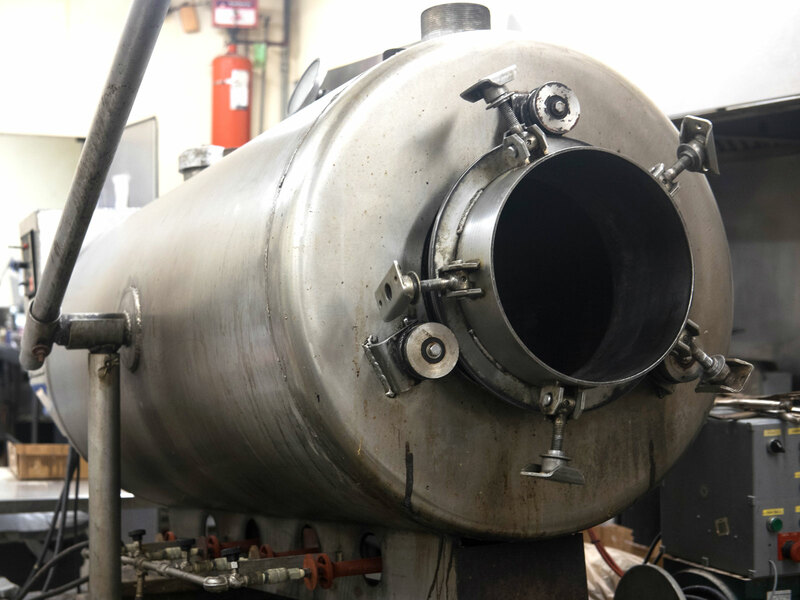 When a dish is done cooking, the same machine has a cooling function, bringing the temperature down so it can be portioned out, vacuum packed, and frozen. Just behind the glass case in the front of the restaurant, Bellue shows off the table that keeps 200 gallons of water hot 24 hours a day. Those bags of frozen dishes are simply warmed in the water—whether one or dozens at a time—and they’re ready to go. “We could do a catering for 500 tonight, if need be,” says Bellue of how efficient the system is. Each of the innovations in his homemade kitchen solves a different problem: the rotating flat-top to toast buns without hot spots, a vertical smoker because “the first thing they teach you in science class is that heat rises,” and the giant pressure cooker. “If I see something wrong,” he says, “I fix it.” But he’s also increasingly aware that he won’t always be around to do that. “You worry when you get to my age,” the septuagenarian says—though he points out that his mother is still around at 96. “People come in every day, they love this food. It would almost be a sin to see this fall by the wayside.” But without an exit strategy, knowing his kids won’t take it over, all he can hope is that somebody sees the value and buys it up. “I guess when you’re dead it doesn’t matter,” but he holds out hope that the business won’t die with him. And, he suspects, a lot of the people who stand in the lines stretching out the door for their holiday meals and those who mail order the food from around the country hope so, too.